Photographs, they say, speak louder than words. Within each frame of a given photograph are hidden varied emotions ' joy, happiness, aspirations, disgruntlements, pride, hopes, sorrows, and many more. And more often than not each picture has a story to tell ' sometimes a story of struggle, of determination and grit and of triumph over all odds. Put together they symbolize a moment in history ' even speaking from the other side of silence, telling us 'her' story. This is what 'Representing Indian Women ' 1875-1947', a visual documentary, a collage of photographs of women from the early days, when photography was introduced in India, to 1947 was all about. The exhibition was organized at DST Auditorium, Hyderabad Central University, for 3 days ' Jan 28th to Jan 30th. Organized by the Centre for Women's Development Studies, this exhibition of photographs celebrating the transformation of women from the late 19th century to the middle of last century was a riveting revelation. Most photographs had a hazy, worn-out look about them; yet each was captivating in its own way. The exhibition was in five sections ' Visualizing the Family, The Learning Experience, Worlds Beyond, The National Movement and Towards the Midnight Hour. In addition, there were four panels on specific women: noted social reformer, Pandita Ramabai, often called the 'mother of modern India', two early women photographers ' Debaleena Mazumdar and Annapurna Dutta, a pioneering doctor ' Dwarakabai Kamlakar and a school teacher, Sarah Massey. The earliest photographs of women and girls was always in the context of the family, hence the first section was appropriately called Visualizing the Family. Most of these early pictures were taken in a studio atmosphere, with phantasmagoric and surreal backdrops ' from distant mountains to lakes, castles and sometimes even tropical forests. The camera recorded the emergence of men, women and families ' their dressing styles, posture, and relative positions speaking volumes about the society in those days. 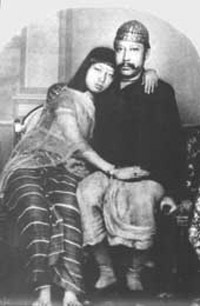 For instance, the way a husband and wife stood together in a photograph was indicative of the relationship between the two ' was it subservient? Was it friendly and comfortable? In one picture, the wife standing right to the husband had her left hand pushed to the back almost as though she was scared of being captured touching her husband; while in others there was an obvious intimacy displayed by the couple. Pictures with just women and children in them seemed to have been clicked within the confines of the four walls of the house, indicative of the zenana culture. In one picture ' depicting a dinner scene that involved the English as well as the Indians ' Indian women were conspicuous by their absence. The positioning of the tables in this picture was also indicative of not only the distinction between the English and the Indians (tables adorned by the English were clearly being waited upon), but also of the class difference among the Indians. This section featured pictures of women affected by the political philosophy of British India as symbolized in its educational institutions. By the later half of the 19th century, education of girls and women featured strongly in the agenda of missionaries, reformers as well as the government. Newly emerging professional and middle-class men encouraged girls in their families including their wives to study, for they viewed limited education as an effective channel for the creation of well-versed companions and better household managers. The importance given to education can be seen even in some of the photographs in the previous section: even women who couldn't read and write were pictured with books next to them. In the initial days, girls were taught at home through the zenana system. Dominant notions of female modesty and the need to safeguard woman's reputation governed access to professions and the world beyond home. 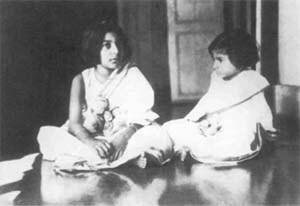 However, pervading missionaries of the time ensured that girls were taught to read and write as well. 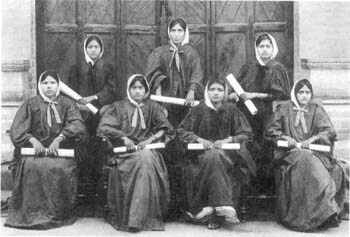 Indian women took big strides towards not only educating themselves but their sisters as well. 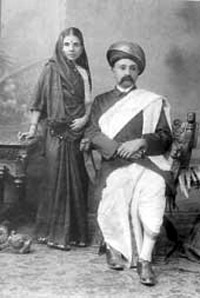 In 1877, when no British university had granted degrees to women, Kadambini Basu (later Ganguly) and Sarala Das sat for the entrance examination for the University of Calcutta. 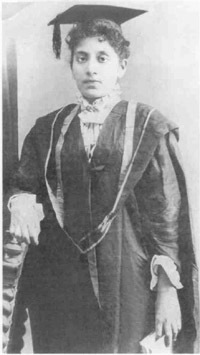 Kadambini later became the first woman doctor of the British Indian Empire, starting a trend in professional education for women. Other early recipients of educational opportunities such as Rokeya Sakhawat Hossain, Sister Subbalakshmi established their own educational institutions and worked hard towards gender equality in education. This section included photographs of women in the world outside of homes ' women as workers. For a majority of Indian women who had to earn their daily living, there never existed a dichotomy between the public and private space. They had been visible and articulate as agricultural labourers, workers in cotton mills, tea and coffee plantations, factories and in the service sector. But education, changing lifestyles symbolized at one level by the changing dress styles and new professions saw the emergence of a new group of women workers stepping out of the safety net offered by homes and into the world beyond. Women became doctors, nurses and teachers. This section carries a few of those visuals of women in fields, in plantations, market places and others. Women in the word outside didn't only mean women as workers. This section also covers visuals of women in the outside space. Education and employment meant breaking age old traditions that saw women confined to the four walls. Pictures show women celebrating the arrival of the first car, train journeys and excursions. Women started to make forays in aesthetic and creative fields becoming dancers, singers and artists, thereby bringing about changes in notions of feminine roles and modesty. Visuals in this section record contributors of some of these early pioneers in the creative arts as well as of women who traversed the boundaries of the home into the worlds beyond ' and of those for whom such parameters never existed. Quick ' think of the Freedom Struggle and name a woman who partook in the same? 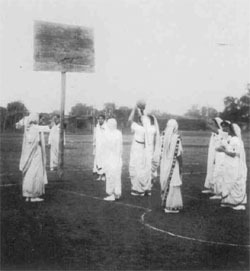 Why is it that it is rather difficult to think of women playing a prominent role during this period of Indian history? It is almost as though women were conspicuous by their absence during this phase. That wasn't necessarily the case. Women were part of the struggle for independence even in the early days, a remarkable breakthrough given the restrictions imposed on them. Initially, women were encouraged by their fathers and husbands, but soon many others defied families and stepped out. The freedom movement was sustained by women in many ways. They endured lathi charges, courted arrests and even went underground, when required. Some took to armed struggle (the women's wing in INA) and risked their lives as revolutionaries. On several occasions, when male leaders were sent to jail, women took over decision making, their authority and self-confidence evoking widespread respect. Photographs document vignettes of this entire process of women's evolution as active political beings in critical phase of the country's history. The final section captures the time from early 40s ' the time of World War II, Quit India Movement ' to the early days after independence. Photographs show women taking part in the intensified struggle for freedom, women as victims during Partition, the ordeal of refugee camps and of long treks out to inhospitable lands. Excitement and pride over the events leading to the country's independence drew women to new roles and as the months rolled on, into professionalism and recognition in expanding areas. This section captures a bit of this atmosphere as the country and its women moved towards the midnight hour, to freedom and a sense of challenge and commitment. Walking through the gallery adorning these photographs was to me a riveting and humbling experience. It was almost like walking through the annals of history, understanding myself, where I come from. This exhibition was a pioneering effort, just like Susie Tharu and Lalita's work on Indian women writers. It was important to know, to understand 'her'story ' to realize that whatever we do today was easy in comparison to what they had to go through. This knowledge, I believe, helps one realize one's own self; for, 'to establish consistency with one self is to reclaim the real self underneath the layers of the imposed restrictions; it is to recognize how much like other women we are, how much we need to grow on, and how good it is to appreciate these connections'. Tomorrow is Women day and I was looking for inspiration, I enjoyed what you published, thank you so much! if you want to keep in touch, I'm on Facebook: are you too? take care, peace & have a nice day! I just came across this article and this has served as a source of inspiration to me. 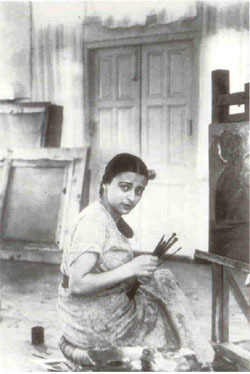 Indian women in the late 19th century n early 20th century have always captivated my imagination. These photographs gave me the glimpse of transformation that Indian women went through. I wish I get to see more of these old black and white photos. Thank you for this article.